The day at Tomales started very pleasantly with some high partial cloud cover. Plan A was to visit the Tule Elk reserve at Tomales Point, the northernmost tip of the Point Reyes National Seashore. The amazing thing about the weather here is just how localized it is. We drove the 10 miles or so south down the east side of Tomales Bay to good ol’ Point Reyes Station in order to cross over to the Point Reyes National Seashore. At Point Reyes Station the sky was clearer. By the time we had driven eight miles or so back up the western side of Tomales Bay towards Tomales Point we were now about six miles from home as the crow flies and under the good ol’ coastal fog. There are about 300 Tule Elk established here and we did see some of them, though the fog was making things a little too “soft focus”. We also tried a mile or so of a walk from the end of the road towards Tomales Point itself. We could hear the ocean crashing on the seashore below but couldn’t actually see it through the fog. Having decided that we were just doing it because it was there, we returned to the car hoping that we could visit these impressive animals again in clearer conditions. Plan B: since we have to drive back down towards Point Reyes Station on the way home, call back in to the Bear Valley visitor centre and check out Kule Loklo. I’d seen the name Kule Loklo on our previous walking visit to Bear Valley but didn’t know what Kule Loklo was. I learned from a guide book that it’s the name of a reconstruction of a village of the Miwok people. These are the people with whom Sir Francis Drake is thought to have traded when he was at what is now Drake’s Bay making repairs. Volunteers have spent thousands of hours building the Kule Loklo village reconstruction. 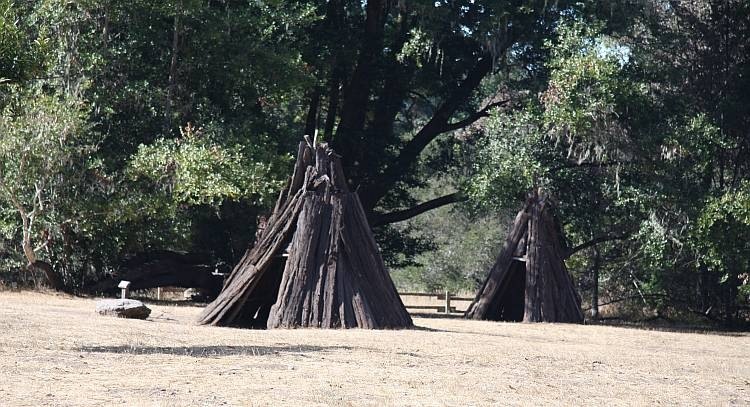 The Miwok apparently lived in shelters made either of tule grass or of redwood bark, the redwood bark shelters being more resilient and longer lived. Five or more people would have lived in these very small shelters. 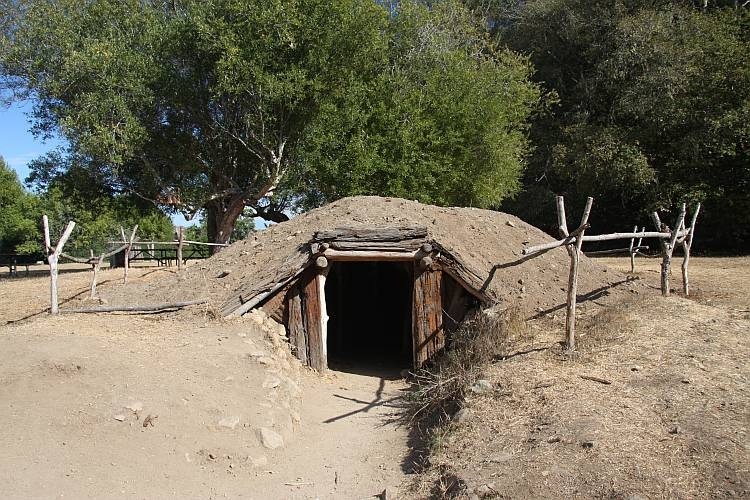 Included in the reconstruction is a sweat house used by the Miwok men for health and spiritual purposes. This construction was the province of men only though family groups would also indulge in saunas together elsewhere. The Miwoks’ staple was acorns which were gathered and ground into a flour. Enough acorns were gathered during the season and stored in granaries, safe from wildlife to see them through the winter. Acorns still seem very popular in these parts. While we were nosing around Kule Loklo, Carol spotted yet another species of woodpecker, the Acorn Woodpecker. It has two curious habits for a woodpecker. Firstly, it lives in family groups. 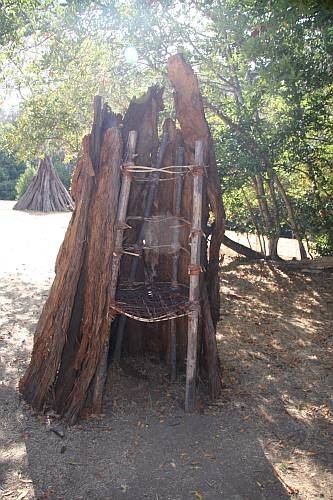 Secondly, it spends much of its time storing acorns, just like the Miwok people. In the woodpeckers’ case, the acorns are stored in individual holes in tree trunks. It seems to be very detailed work since, as the acorns dry out and shrink a little, the woodpeckers move them to more precisely sized holes.